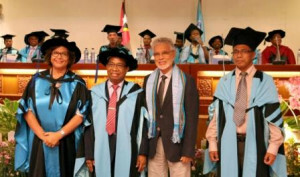 On the 24th of November the President of the Legislative and Justice Sector Reform Commission Jorge Graça, the Rector of the National University of Timor-Leste, Francisco Miguel Martins, and the Dean of the Faculty of Law, Maria Angela Carrascalão, signed a Memorandum of Understanding for cooperation in the field of ongoing research, creating the foundations for legislative reform. The Memorandum of Understanding establishes a partnership of mutual benefit, to research, and disseminate laws, provide training and deepen the scientific and technical aspects of legislative reform. This partnership is part of an inclusive cooperation and consultation methodology involving participants from various sectors of the Timorese society, particularly in academic institutions. The goal is to get a more detailed analysis of the legislation, by law areas and sectors of activity, and take advantage of the vocation of the University and its Faculty of Law, as a centre of scientific research, higher education and the dissemination of knowledge on Law.